Preheat oven 400 degrees. Spray 13x9 baking dish with non stick cooking spray. In a medium bowl, combined tomato sauce, mushrooms, salt, pepper, garlic powder and italian seasoning. Build: Spread half the tomato sauce mixture on bottom of baking dish, spread ravioli evenly, sprinkle cheese, spread remaining ravioli, add spinach, remaining tomato mixture, sprinkle cheese. Cover with tin foil, place in oven and bake for 40 minutes, than uncover and cook additional 15 minutes. Note: You can use beef or cheese frozen ravioli. What a great end result.Would not think of combination like this. This recipe is truly a testament to Christine's Pantry. Frozen ravioli, canned mushrooms, canned tomato sauce, pantry items that make a busy life style possible to still cook amazing dinners! 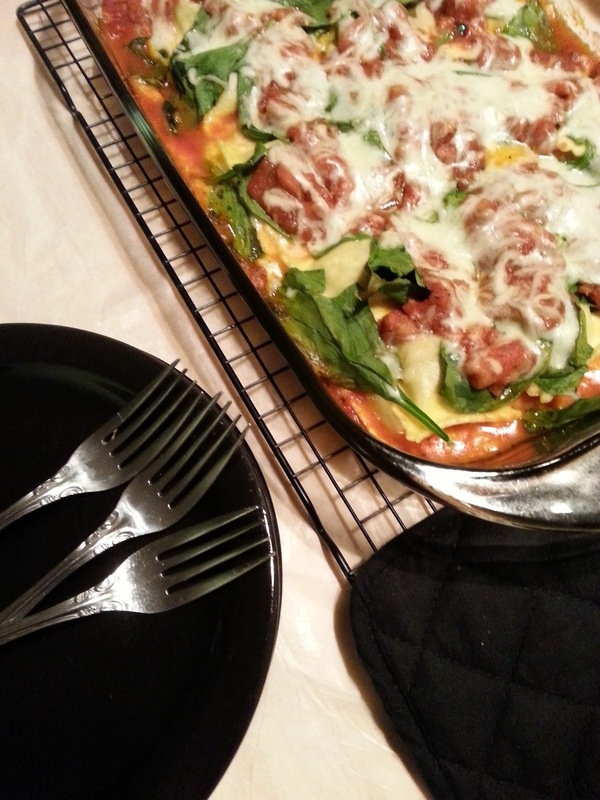 Your Ravioli Lasagna looks amazing, Christine! I definitely wouldn't be able to stop at one piece! What a delicious dish and I love that it's easy to get to the table. It's the perfect comfort food for this cold weather! Oh, Christine, comfort food at its best!